Yingjie Jay Guo was born in 1958 in Hebei province, China. At the age of 16, he finished high school and was sent to the countryside to work on the farm fields. Three years later in 1977, when the Chinese higher education system was restored under Deng Xiaoping, Jay enrolled at Xidian University in Xian, a university specialised in telecommunications. Later he was admitted to Xian Jiaotong University in the same city as a PhD candidate. In 1987, Jay was awarded a PhD in antennas and electromagnetics and became one of the few Chinese researchers holding a PhD degree. In 1989, Jay was invited to the University of Bradford, UK, to conduct research on communications antennas. He worked as a postdoctoral assistant, Research Fellow and later a Senior Fellow. During this research period he invented a number of new Fresnel antennas, published over twenty papers and one book, and became a world-leading researcher in the field. From 1995, Jay served as the Deputy Leader of what was by then a high profile signal processing research group. His responsibilities included research management and leadership, research and teaching. The papers he co-authored then on wireless LAN antennas and channel estimation are among the most cited ones on the subjects. From 1997 to 2000, Jay was a Research Leader at Fujitsu Telecom R&D Centre, London, where he led a number of research projects on advanced technologies for 3G. He was Fujitsu’s representative in the 3G standardisation body 3GPP, and industrial advisor to UK Mobile VCE. In particular, he played an instrumental role in the development of Fujitsu’s smart antenna test-bed. From 2000 to 2005, Jay spent five years serving as Manager of System Strategy and Manager of Strategic Planning, respectively, at Mobisphere Ltd, a Siemens and NEC joint venture for the development of the third generation (3G) mobile communications networks. He was responsible for Strategic Planning, Future Technology and Product Roadmaps and Advanced Product Development. In particular, he initiated and played an instrumental role in Siemens and NEC’s joint development of high-speed packet access (HSPA) technology and made significant contributions to other advanced projects such as new generation base stations and radio network controllers (RNC). In August 2005, Jay moved to Australia to take up the role of the Director of Wireless Technologies Laboratory in CSIRO ICT Centre, managing over 70 researchers. Under his leadership, the laboratory achieved world-class technology breakthroughs in gigabit wireless systems and antennas. It formed new research collaborations with major international companies and organisations including Telstra, Thales, Boeing, Rockwell Collins, NEC, CETC and the Chinese Academy of Science. The laboratory has also made a major impact in Australia by delivering technologies and services to the Federal Government and the private sector. 2009 Australia Engineering Excellence Award, NSW, to the team led by Mark Hedley for the development of the wireless ad hoc system for positioning. In 2009, Jay created the Australia-China Research Centre for Wireless Communications with initial funding of $2m from the Department of Industry, Innovation Science and Research (DIISR), the Australian Federal Government; The Ministry of Science and Technology (MOST), China; Beijing University of Posts and Telecommunications (BUPT); and CSIRO. By 2010, he had attracted thirteen academic and industrial partners from China and Australia to the joint centre. In November 2009, with the support of CSIRO and the Science and Technology Commission, Shanghai Municipality, Jay initiated the Australia-China ICT Summit to facilitate high-level collaborations between the two ICT communities, serving as the Australian Executive Chair of the Organising Committee. Since July 2008, Jay has been serving as the Leader of the ‘CSIRO Broadband for Australia’ Theme. His main achievements include: creating a major program to tackle the national challenge of broadbanding rural and regional Australia; partnering with the government agencies and Australian Industry; and winning $10m from the Scientific and Industrial Endowment (SIEF) fund. The Theme has grown by 70% in 1.5 years and it is currently focusing on a new broadband wireless access technology and a 10 Gb per second microwave backhaul. Australian Telecommunication Networks and Applications Conference (ANTAC). 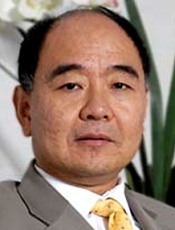 He is Chair of the Technical Program Committee of IEEE WCNC 2010, and 2007 IEEE International Symposium on Communications and Information Technologies (ISCIT). Jay has published three scientific books and over 130 scientific papers in top research journals and at refereed conferences, and holds fourteen patents. He is an Adjunct Professor at Macquarie University, Australia, and a Guest Professor at the Chinese Academy of Science.